Coverage: Live text and radio commentary of all three days, plus TV highlights of qualifying and the race. Full details here. World champion Lewis Hamilton says he expects to finish his career with Mercedes - and will probably only compete for another seven years. The 30-year-old sealed his third drivers' world title with victory at the US Grand Prix last weekend. The Briton had been linked with a move to Ferrari, but in May he signed a new three-year deal with Mercedes, taking him up to 2018. "I honestly can't see myself anywhere else," said Hamilton. "I imagine beyond this three-year deal there could be one more contract of three or four years and that would be it for me." 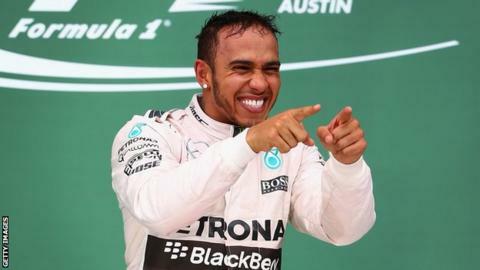 That could mean Hamilton, who joined Mercedes from McLaren in 2013, retiring from the sport in 2022, aged 37 - with a maximum of 10 titles to his name. His victory in the US saw him draw level with racing greats Sir Jackie Stewart and Ayrton Senna as a three-time world champion. Former British F1 champion Nigel Mansell thinks Hamilton should target Michael Schumacher's record of seven world titles. Hamilton, who competes at the Mexican Grand Prix this weekend, added: "There was always that talk of driving another car and I have done that - ticked that box off. "I don't like to say never, but I think it would be pretty awesome to finish my career with this team."